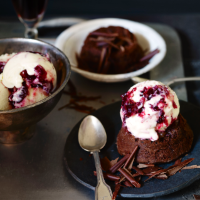 The tangy, cranberry sauce rippled through luscious crème fraîche ice cream, served with moussey, flourless chocolate cake will win over anyone who’s not sure about fruit with chocolate – it’s simply too good to resist. 1 Start by making the ice cream. Put the cranberries in a small saucepan with 3 tbsp water. Bring to the boil, then simmer until the berries begin to burst – about 3-4 minutes. Add 50g sugar and simmer gently for 6-8 minutes, until jammy. Cool, then cover and chill until needed (it will keep in the fridge for up to a week). 2 Put the milk, vanilla pod and seeds, and a pinch of salt in a saucepan. Bring to the boil, then turn off the heat and leave to infuse for 20 minutes. Whisk the egg yolks and remaining 100g sugar until thick and pale. Gently bring the infused milk back to the boil, then slowly pour into the egg mixture, whisking all the time. Return to the saucepan and stir constantly over a very low heat for about 10-12 minutes, until the custard thickens enough to coat the back of the spoon. Sieve the custard, then cover and cool completely, before chilling. 3 Fold the crème fraîche into the chilled custard until combined, then pour into an ice-cream maker and churn until the blade slows down (about 15-20 minutes). Transfer to a chilled freezeproof container and ripple through the cranberry sauce; don’t overmix. Cover and freeze for at least 4 hours, or overnight, until firm. 4 For the cakes, preheat the oven to 180°C, gas mark 4. Grease a deep 6-hole muffin tin or 6 dariole moulds (each about 150ml in volume) and line the bases with circles of baking parchment. 5 Melt the butter, chocolate and sugar together in a heatproof bowl set over a pan of barely simmering water. Remove from the heat, stir until smooth, then mix in the vanilla, almonds and cocoa, followed by the egg yolks, one at a time. 6 Whisk the egg whites to stiff peaks in a clean bowl. Fold 1 tbsp into the chocolate mixture with a metal spoon to loosen, then fold in the rest in 3 additions, retaining as much air as possible. Spoon into the moulds and bake for 20 minutes, until puffed but barely firm. 7 Cool slightly before turning out each cake and serving with the ice cream (or, more simply, with chilled or whipped double cream), and some chocolate curls, if liked.